Two of the more influential artists in the world of thrash and acid metal back in the 1980’s were brothers, Max and Igor Cavalera. Max founded the band Sepultura, a Brazilian Metal band in 1984, and for nearly three decades, they rocked Brazil, Europe, Australia, and the rest of the world. On August 16, 1996, while Sepultura was on the Monsters of Rock tour with band like Ozzy Osbourne, Paradise Lost, Type O Negative, Biohazard, and Fear Factory, Max heard the news of his step-son’s death and abruptly left the tour to be with his family. This was the beginning of the end with Sepultura for Max. A year later, Max was back on stage, but it was with a new band, Soulfly. After ten years of silence, Max got a call from Igor and they found themselves working together again. On August 17, 2006 during the 10th Annual D-Low Memorial show, Max reunited with his brother Igor, whom had not been on stage together since 1996. They played some of their originals written for Sepultura. 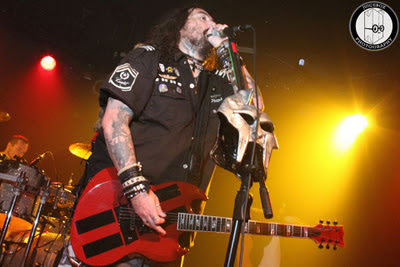 Max said that Soulfly is still very much an active band, will be releasing their 9th studio album in spring of 2012 and will also go on tour beginning in Australia. In 2007, Max created another band called Inflikted. Max and Iggor decided on a new name that represented their family and called it, Cavalera Conspiracy. This new band was a newer sound, which Max describes as his “roots” of metal, a “super metal” as he called it, that combines the sound of 80’s trash and death metal and the modern sound of today’s metalcore. Their debut album, “Inflikted” was released through Road Runner Records in 2008 and in their first week, ranked No. 72 on the Billboard 200 and ranked even better in countries like Australia, Finland, Austria, Belgium, and Germany. 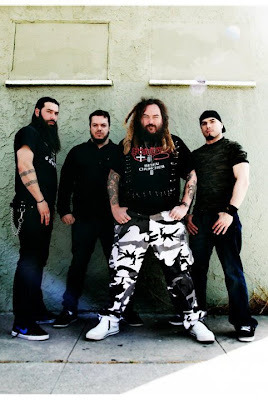 Early 2011 was the release of Cavalera’s sophomore album entitled, “Blunt Force Trauma”, an in your face metal album that digs deep into one of Max Cavalera’s favorite topics, and that is his love for history. Songs like Genghis Khan, Warlord, Burn Waco, and Rasputin were influenced by his love for history. Events in history were his inspiration for his lyrics. Knowing the background of a band’s story behind the music and the reason for their lyrics, but it also gives the artist a new found respect. Cavalera Conspiracy ended their 2011 tour in November, but this is not the end. During the off season, Max and Igor will be hard at work writing new material and will be headed back in the studio for their new album sometime in 2012. Learn more about Max Cavalera Conspiracy in our live interview with Max while he was on tour in Los Angeles, CA at The Great Unknowns Presents and All Indie Magazine. *All music and interview permission was granted by Road Runner Records. Interview was recorded live on location in Pomona, CA.